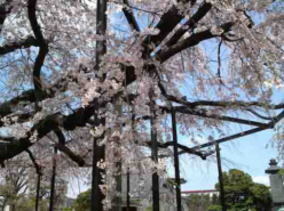 Walk down along the Mama-gawa River and 100 meter after passing through under the Keiyo Highway, you could find a pagoda in your right, that is Barakisan Myogyoji Temple. 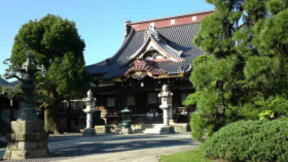 Myogyoji Temple is one of a temple belonging to Nichren Sect at Ichikawa City in Chiba Prefecture. 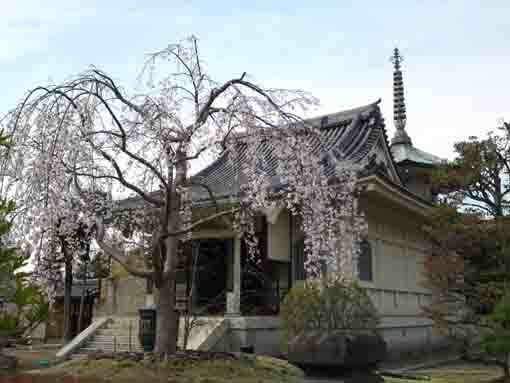 It was built in 1538 as a branch temple of the Grand head Temple of Nakayama Hokekyo-ji Temple, but now it is an independent temple of Nichiren Sect. Myogoy-ji Temple has the Jukkai Mandala (a mandala of the ten worlds; the six worlds of delusion and the four worlds of enlightenment) and a statue of the founder venerable Nichren as the main object of worship. 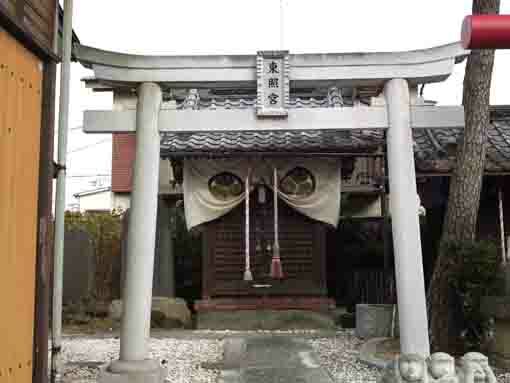 The temple also has 'Katyu Shutsugen Bouka Soshi Zou (a picture of the founder venerable Nichiren appeared in the fire for prevention of fires). 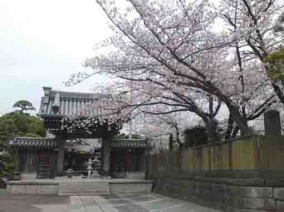 In addition, the drooping cherry tree and embossed carving on the temple gate are very famous. 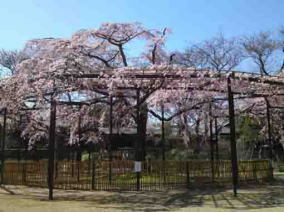 And it is also famous that Kafu Nagai often visited it. The temple gate, pagoda, main hall and garden are excitingly beautiful. Especially, the embossed carving and sculptures on the gate is great. 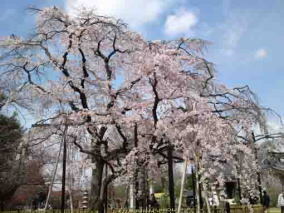 Moreover, the cherry blossoms on the over 50 years old drooping cherry tree are very beautiful, many people visit and enjoy seeing them in spring. 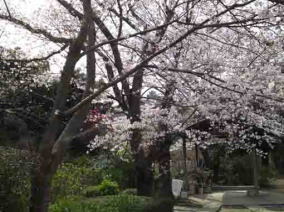 Myogyo-ji Temple was built here by Nisshin, a priest at Enzoin of Nichiren Sect in July 1538 to preach. 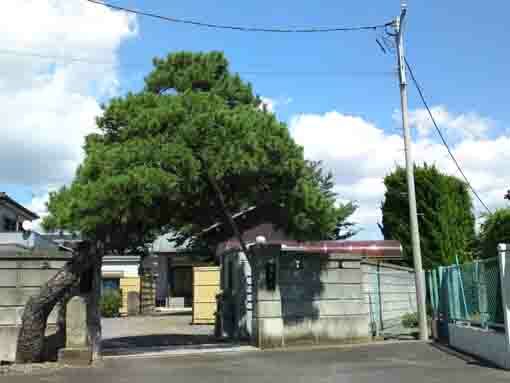 At that time, there were only about 40 houses in Baraki village, and Nisshin was successfully engaged in his missionary works and all people in the village became his believers, then he continued his missionary work to the regions next to Baraki. 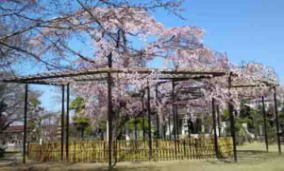 Nisshin built the foundation of Myogyo-ji Temple. 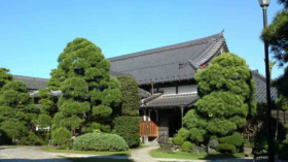 Myogyo-ji Temple preserves the picture of the founder venerable Nichiren painted by the priest Nippo. 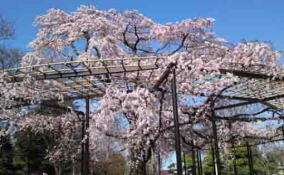 It was moved from Ansei-in of one of the sub temples in the site of Nakayama Hokekyo-ji Temple of the grand temple of Nichiren Sect by Takeuemon Hirata when Ansei-in got fired in Descember of 1762. Therefore it has been called 'Katyu Shutsugen Bouka Soshi Zou (a picture of the founder venerable Nichiren appeared in the fire for prevention of fires) since then. In August of 1791, the big tsunami struck the shore along Tokyo Bay from Fukagawa in Edo to Gyotoku and Funabashi, Baraki village was hit by it and lost a lot. Everything in Myogyo-ji Temple was swallowed up by the Tsunami, and the priest Nikko, the 25th of the chief priest of it was drowned by it. According to the diary of his topographical survey by Tadataka Inou, the most famous geographer in Edo Period, 58 houses were swallowed, 113 people living in Baraki village and 40 people calling at were drowned by the Tsunami in 1791, it told us how big the Tsunami had been. 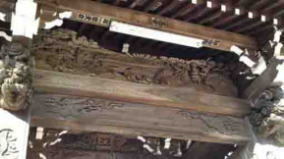 The Priest Nichiun, the successor of Nikko, immediately started to rebuild the halls at Myogyo-ji Temple. Moreover in October of 1795, the priest Nikkei, the chief priest of Kyoei-zan Daikyoji Temple at Shibamata (it is very famous for the Taishaku sama in Shibamata and its temple's town appeared on the film 'Otoko wa Tsuraiyo (It's Tough Being a Man)') ) in Katsushika-ku, Tokyo ordered to build thetower erected for the repose of the drowned victims' souls. Once Myogyo-ji Temple declined by the anti-Buddhist movement in the Meiji era that led to destruction of Buddhist temples after the Meiji Restoration. However when Nichijun from Baraki village succeeded the 36th chief priest of Myogyo-ji Temple, many believers returned and they gave much donation to the temple. 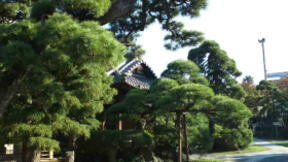 Then the 37th chief priest, Nikko rebuilt the buildings at Myogyo-ji Temple. Now you could see them in it had been rebuilt at that time. 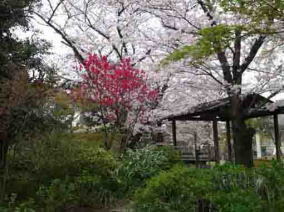 Myogyo-ji Temple was a temple that Kafu Nagai visited. 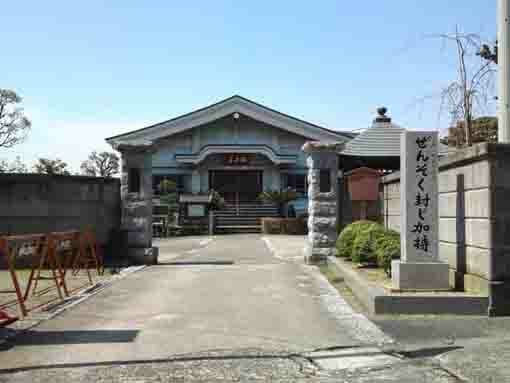 Kafu Nagai, a writer, lived in Ichikawa City from 1946 to his end of 1959. He loved to walk along streams to eager to know theirs fountainhead and estuaries or distinations since his childhood. Kafu called at Myogyo-ji Temple while he was searching for the distination of Mama-gawa River, he was much impressed by it, and reminded. 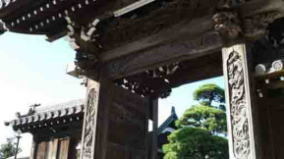 Therefore the sculptures on the gate and the views at Myogyo-ji Temple sometimes appear on his works such as his diary, Danchotei Nichijo and as in his essay, Katsushika Miyage. Acooding to Danchotei Nichijo, Sunday November 30th, it was warm and fine. In the afternoon, he went out of the south entrance of JR Shimousa Nakayama Station and walk around the road in the field. There was a stream in the field and a concret bridge called Yanagi-bashi Bridge crossed over it. He asked it to a farmer, then the farmer told him that it was called Mama-gawa River flowing from Onigoe to the sea. 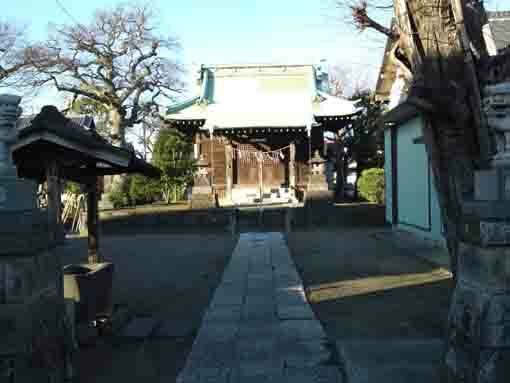 Kafu walked along the river about 20 minutes and he reached at the back of a large temple. 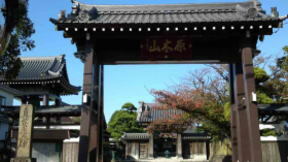 He went along the fences surrounding the tombs and found a road to connect the front gate of it, then Kafu went into the temple. 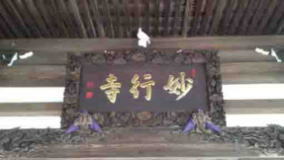 The name Baraki-san was written on the gate, the name Myogyo-ji Temple on the main hall. On the pillars and beams of the gate, there are a lot of scraptures. 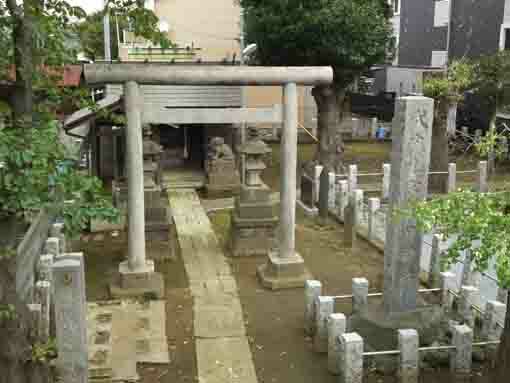 The street laid in front of the gate stretched to Gyotoku to the east and to Funabashi to the west. It commanded a wide view, threre were nothing to obstruct it. Kafu wanted to go to the shore, but he gave up as the farther distant to the sea. Then he went back to the station and took on the train. At his house, Kafu asked his family and find how to read 'Baraki'. 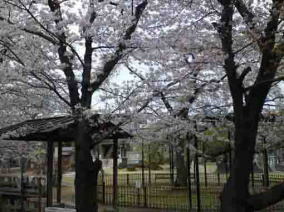 Myogoji Temple is actually famous for Cherry Blossoms, but pine trees in it are also beautiful. 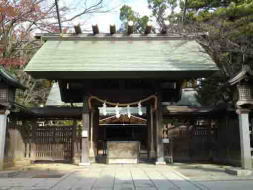 Most people visiting Myogyoji Temple stop at the gate to see the relief on it. 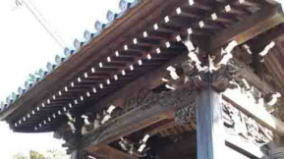 The wooden gate has many skillful works on it. 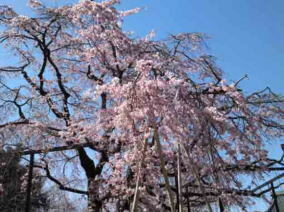 The drooping cherry tree in Myogyoji Temple looks enough beautiful even though it stands alone, so it blooms a week earlier than other cherry trees. 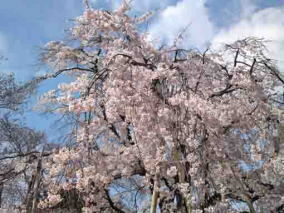 Moreover, it informs us when the sakura season in Ichikawa comes. 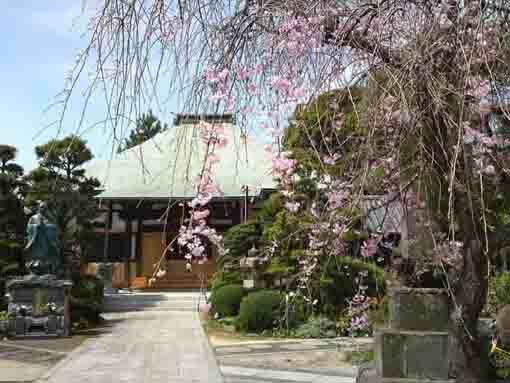 Myogyoji-Temple has a great accessibility from both Narita and Haneda International Airport.